Are you confused about exactly what YouTube’s playback volume normalization is doing to your music ? Maybe you understand the basic idea but struggle to predict exactly what will happen when videos are uploaded ? Well, that’s understandable – the procedure is still inconsistent and unpredictable. Some songs are measured and normalized right away, others take weeks, some never seem to be normalized at all. But it is happening – and YouTube just added an important new feature which can really help you get a grip on the process. You can now see exactly what effect the system is having on our audio, because YouTube have exposed the normalization data in their interface. You just need to know where to find it – and what it means. To see it for yourself, right-click on any YouTube video and select the “Stats for nerds” option. The first percentage describes the Volume slider setting in the YouTube player window, and can be adjusted by clicking on the “speaker” icon and dragging the slider up or down. The second percentage reflects the normalization adjustment being used. This is the amount by which the playback volume of the clip has been turned down to prevent users being blasted by sudden changes in volume in comparison to everything else. The value scales in proportion with the Volume slider setting. So for example, if the normalization percentage reads 60% when the Volume slider is at 100 %, it will scale down to 30% if you move the Volume slider to 50%. This means that if you want to use these stats to compare songs with each other, you should always set the Volume slider to 100% first. The final value is the “content loudness” value, and indicates the difference between YouTube’s estimate of the loudness and their reference playback level. This value is fixed for each clip, and isn’t affected by the Volume slider. So for example a reading of 6dB means your video is 6dB louder than YouTube’s reference level, and a 50% normalization adjustment (-6dB) will be applied to compensate. Whereas a negative reading of -3dB, say, means it’s 3 dB lower in level than YouTube’s reference, and no normalization will be applied, so the normalization percentage will always be 100% of the Volume slider’s value – YouTube doesn’t turn up quieter videos. Firstly, these “Stats for nerds” give you a quick and easy way to check whether your video has been normalized yet. If there’s no “content loudness” value listed, the video hasn’t yet been normalized, and the second value will always be the same as the Volume slider percentage – the song will be played as loud as the Volume slider allows. Secondly, if there is a “content loudness” value listed, then your video is being normalized, and you can see exactly how much by setting the Volume slider to its 100% maximum, and checking the normalization percentage value. 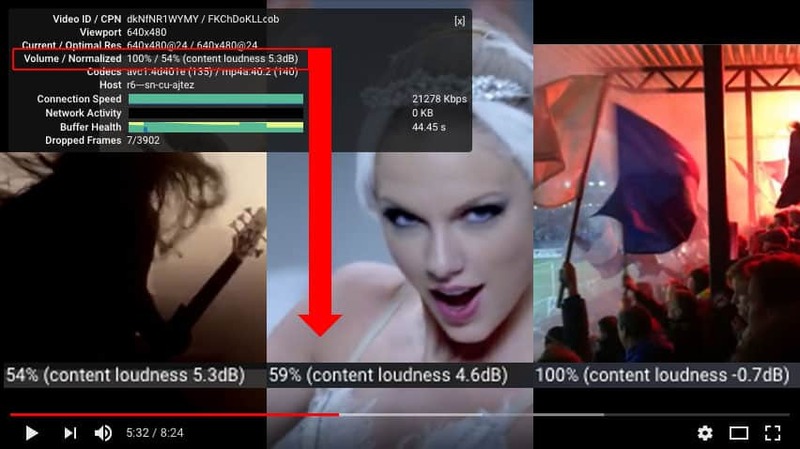 So in the image above, for example, the Metallica song is being turned down to only 54% of it’s original volume (-5.3 dB) and Taylor Swift’s “Shake It Off” is also being turned down by a substantial 4.6 dB. Whereas the final video in the image is a song that I mastered myself recently – a trance/techno track called “Vi er GodsetGutta” by B Killax – and because YouTube measure it as being 0.7 dB quieter than their desired reference level, it always gets played as loud as the Volume slider setting allows. Thirdly, it means that if you want your music to stand out in comparison to everything else, you want to avoid large positive or negative “content loudness” values – you need to optimise loudness, not maximize it. The great news is that when you do this, your music will actually “pop” more other songs, in my experience. For example the song I mastered actually has more punch and impact than the other two, in my opinion, especially in the low end – despite having been mastered at a lower level. Which of course is exactly what you would expect, because it has better micro-dynamics. To see if you agree with me, take a listen to the playlist here. How do we use this ? Apart from being interesting, the fact that YouTube have made this information visible means that you can test the effects of normalisation yourself. Simply upload a song, wait for it to be normalized and check the stats. And then you can tweak, re-upload and test again, if you like – to try and get an even better result. By all means check out the Stats For Nerds for your songs, and see how they compare with other similar tracks – and of course, how they sound. But getting drawn into a cycle of uploading, testing and re-uploading over and over isn’t an efficient way to work, in my opinion. For one thing, it’s really tedious ! And more importantly, at the rate YouTube are releasing updates to their normalization system, there’s no guarantee that what works today will still work tomorrow – or next month, or next year. It’s far better to aim for a result in mastering that you can be confident will result in minimal normalization changes to your audio, and therefore maximize both the playback volume, and the punch and impact of the music. That’s the method I used to master “Vi er GodsetGutta” – and every other song I work on, for that matter. All the examples I’ve found on YouTube are being played with no volume reduction from normalization, and are assessed as being within 1 dB of YouTube’s reference level. And it works on all the online platforms, not just YouTube. It’s a simple method, and straightforward to implement – and I explained it in a blog post a few days ago. (Hint: it’s not about aiming for -14 LUFS !) To find out how it works, click here.